This article will cover some of the basic features of Anova.Golf. When you first sign into your account, you will see your dashboard. 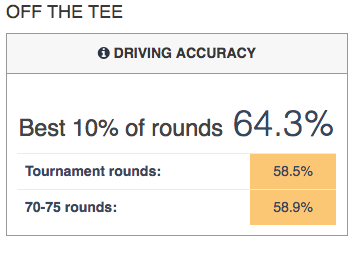 When you have entered a round, you will see a summary of all of your most important statistics on this screen. Note: As you are starting out and don't yet have any rounds in your database, you won't be able to use your own data for the "compare to" options since for example the option "Last 5 Rounds" requires that you have 5 rounds in the database. As you add more and more rounds, the sample data will disappear and be replaced by your own information. If you want to see how this works, you can enable 'sample information' by going to 'settings', 'preferences' and then clicking on 'show sample records' (see bottom of this article). At the top of the screen, you can see three dropdown menus. The first one is the "Baseline" dropdown. This is an important choice because your selection here will determine your "baseline" or the main data set you are using in Anova. 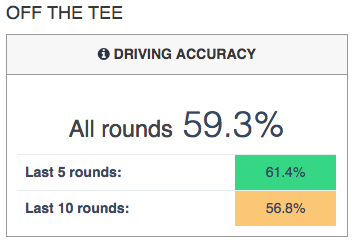 In this case, you would be using "All Rounds" as your main data set, and then comparing that data set against "Last 5 Rounds" and "Last 10 Rounds". It gives you in-depth details on that particular part section of your game.